This past Sunday my mother-in-law kindly treated my daughters and me to tickets to see the National Tour of the Rodgers and Hammerstein Broadway musical, Cinderella. Of course it was lovely and magical; even my high schooler gasped when Cinderella’s rags magically turned into a ball gown right in front of our eyes. Why would a fellow want a girl like her, a frail and fluffy beauty? Why can’t a fellow ever once prefer a solid girl like me? And with very little trouble, I could break her little arm!! Why would a fellow want a girl like her, so obviously unusual? Why can’t a fellow ever once prefer a usual girl like me? She’s only as graceful as a bird, so why is the fellow going crazy? Why can’t a fellow ever once prefer a girl who’s merely me? What’s the matter with the man? Clever cunning, ever charming, how do I make him see I’m special? Loosen my dress, help me, I’m starting to faint! Ah, the usual feminist refrain…there is no such thing as a universal standard of beauty! But of course there is and to say otherwise is really quite delusional. We plain girls do best by accepting it, making the most of what we do have in the looks department, and then being darned charming to make up for the lack of objective physical beauty. One overcomes being plain by being sweet, not by being horrid. After all, if you wish to catch a fly, you use honey, not vinegar. But really, it is liberal modernity that insists there are no absolute standards; feminists aren’t even clever enough to come up with that idea by themselves, the poor dears. Do you remember a while back I had my own little lament about how I didn’t have the right words to talk about politics because “left” and “right” no longer make any sense to me? …to talk about politics, we have to use these grossly inaccurate terms that don’t really mean precisely or even approximately what we want to say. We end up sounding like teenage girls gossiping about their frenemies instead of mature adults using wisdom and good judgement to decide upon a course of action. Well, I read with interest several recent posts at Zippy Catholic, from which I will pull two quotes for your consideration. We can think of modern politics as a mental prison composed of a soft chewy center, a comfortable center made of left-right faux opposition within the Overton window – differing mainly from place to place on how many and which particular unprincipled exceptions to liberalism are allowed. Of course, that makes quite a bit of sense. This is probably why so much of the news, political discourse, and cultural commentary I read sounds like it was written by middle school girls on the rag rather than rational adults. The good, the true, and the beautiful resides firmly outside the present day Overton Window clogged with (literal and metaphorical) ugly, high-strung, jealous stepsisters in denial of reality. So thank you, grumpy feminist stepsisters, for making the view inside the Overton Window so appalling that some folks actually peek outside for the first time. Artists without talent and judges without courage. 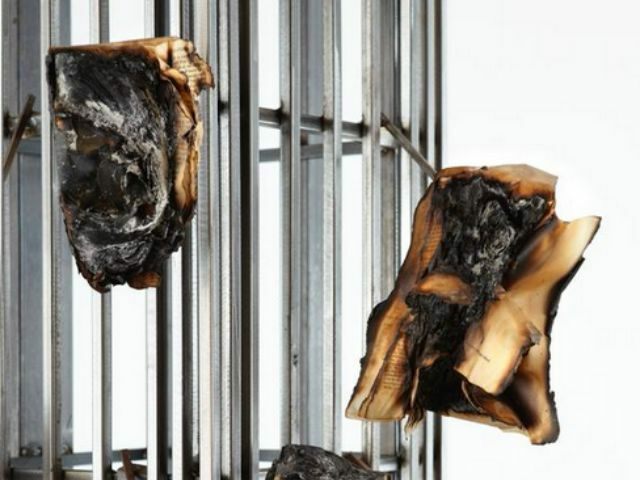 A controversial Art Prize 2015 entry created using the burned remains of three holy texts may be out of the seventh annual event. 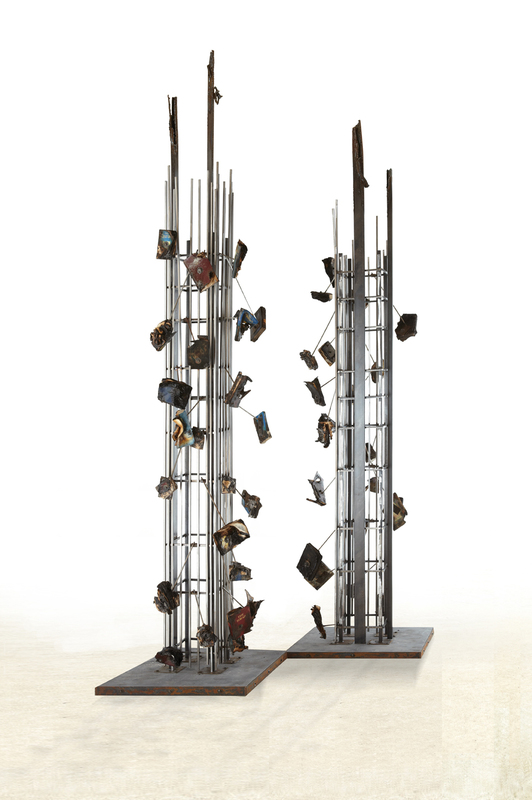 But artist Nabil Mousa has a lifeline if he can find another venue willing to take his sculpture titled “Paradise Built on the Bones of the Slaughtered,” a set of three welded towers displaying ashes of the Bible, the Koran and the Torah. Its intended venue was Grand Rapids City Hall. But the city has since decided against accepting it. …Mousa, who was raised a Christian, said his sculpture isn’t an expression of anger against religion. Christianity, Islam and Judaism all share the same God and profess to preach tolerance and mutual respect. Yet the three are embroiled in perpetual inter-conflict. “Paradise Built on the Bones of the Slaughtered” illustrates his disenfranchisement with religion beginning with his experience in coming out gay to his family years ago. “It was really very hard for me to cope with that,” he said. Though a naturalized American who has lived most of his life in the United States, the 49-year-old artist experienced the same discrimination others of Middle Eastern ancestry experienced following the 9/11 attacks on the World Trade Center in 2001. The first thing that stood out to me is that the city rejected this installation for one reason only: cowardice. Don’t get me wrong – I think the sculpture is an absolute joke, not worth the cost of the books burned to make it. But the only reason the city rejected this is fear of Muslims. Offending Christians is de rigueur in the art world, so we know that had nothing to do with why the sculpture was rejected. But how did art offensive to Muslims work out for Charlie Hebdo or any of the other recent incidents where Muslims were offended by art? It usually ends in serious blood shed. So the decision to reject the piece was most likely not motivated by the fact that the sculpture is a) a ridiculous piece of crap or b) offensive to Christians but most likely because c) the art council fears violence at the hands of Muslims. You’ll never hear them admit it, of course. Either way, I’m not shedding any tears that they rejected it. That isn’t a quote from anyone; that is the author of the news article interjecting his opinion as if it were established fact. In reality, we do not share the same God. Christians believe that Jesus Christ is part of the Trinitarian God comprised of the Father, the Son, and the Holy Spirit. Muslims and Jews absolutely reject this, which means we do not worship the same God. There is some argument to be made the since Christianity flowed out of Judaism in some way we worship the same God, but Islam is a religion that was created in and of itself; it did not flow out of any other religion, despite the fact that Muslims claim Abraham as their forefather. But putting aside the discussion about whether it is the same God or not, I found the way that the news story inserts this debatable opinion as if it were settled science to be quite typical of modern media tactics. Always keep that in mind when you read the news. Uh-huh. So even by modern “art” standards, how did this guy even get noticed? Because he is an A1 victim status seeker, that’s how. Notice how he makes sure to bash Christianity for his emotional distress about revealing his homosexuality to his family. Furthermore, notice how he jumps right on the Me Too! bandwagon of Islamaphobia: It Happened To ME! even though he isn’t even Muslim. He’s working every Officially Oppressed Minority angle he can find. I guess when some charred books stuck to metal bars is the culmination of your artistic abilities, playing the victim card is all you have to fall back on. No talent but plenty of Victim Credibility has Mr. Mousa. Sorry for the silence around here. This weekend my husband was taking Hunter’s Safety so he can get a hunting license. He’s planning to hunt deer with the guy who plows our driveway and another guy from ski patrol; bagging his first deer was on his list of things he wants to accomplish this year. On a whim, the kids and I signed up for the class, too. It was all day on Saturday and Sunday, and I will not live down the fact that I was the only one in my family to miss all three clay pigeons during the trap shoot. Geez, even our ten-year-old hit one, and that was after the Range Safety Officer determined even the 20-gauge shotgun was too big for her and swapped it out for a .410, telling me that she probably wouldn’t be able to break the clay targets with it! I thought she was going to barf, much to the delight of the row of 12-year-old boys sitting in front of us. Shoo, Deerfly, don’t bother me: making a deerfly trap hat. Chances are that if you live anywhere east of the Mississippi, you’ve encountered deerfly…most likely when you suddenly felt a sensation like having a lit cigarette bumped against your bare arm and discovered one of these little horrors lapping up the blood from the hole it just made in your flesh. Deer flies (also known as yellow flies, or stouts in Atlantic Canada) are flies…that can be pests to cattle, horses, and humans. A distinguishing characteristic of a deer fly is patterned gold or green eyes. Deer flies are a genus of horse-flies (Tabanidae). They are smaller than wasps, and have coloured eyes and dark bands across their wings. While female deer flies feed on blood, males instead collect pollen. When feeding, females use knife-like mandibles and maxillae to make a cross-shaped incision and then lap up the blood. Their bite can be painful, but many bites are not noticed at the time, especially if the victim is distracted. Allergic reaction from the saliva of the fly can result in further discomfort and health concerns. Pain and itch are the most common symptoms, but more significant allergic reactions can develop. They are often found in damp environments, such as wetlands, bogs, or forests. They lay clusters of shiny black eggs on the leaves of small plants by water. The aquatic larvae feed on small insects and pupate in the mud at the edge of the water. Adults are potential vectors of tularemia, anthrax and loa loa filariasis. The required products are a large blue disposable cup or bowl, some tanglefoot paste, a putty knife, and something to attach the cup or bowl to. Apparently research has shown that deerfly are very attracted to blue. They approach the hat and become stuck to the tanglefoot paste, where they eventually die without ever biting you. I decided I would make such a hat for myself. I bought the blue bowl, I already had a garden hat and the velcro, so all I needed was the tanglefoot paste. 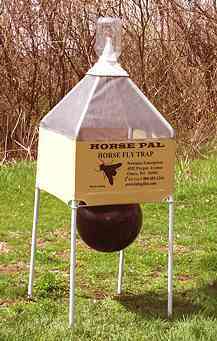 This product, which is used to keep pests off fruit trees, was invented by a Michigan company and produced for the last 100 years or so in my old hometown of Grand Rapids. However, it seems that several years ago it was sold off to a large national corporation which has seriously scaled back production because I could not find it anywhere. I looked online, I looked at all the big box home and garden places like Home Depot and Lowe’s, I checked the local Family, Farm, and Hearth, but no one had it. On a whim, I stopped by the Dexter Mill – from now on, I’m just going to start with the Dexter Mill and then go elsewhere if they don’t have what I need. I will wear this while working in the garden, which is right next to our large pond that brings all the deerfly to the yard, because no one will see me, so it doesn’t matter if I look like a total dork. I’ll use a cap with the deerfly patches whenever I have to go out among other people, like while walking my dogs on our road, so as not to cause my children to die of shame due to having a mother who wears a sticky bowl on her head.